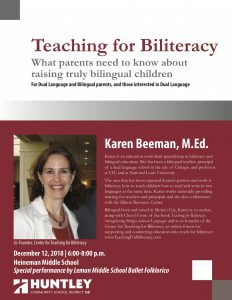 Karen Beeman, nationally recognized expert on biliteracy and bilingual education, will present “Teaching for Biliteracy: What parents need to know about raising truly bilingual children” on December 12, 6:00-8:00 p.m. at the Heineman Middle School Auditorium. Beeman is an education consultant specializing in biliteracy and bilingual education. She has been a bilingual teacher, principal of a dual language school in the city of Chicago, and professor at UIC and at National Louis University. The event is aimed at parents of current bilingual or Dual Language students, as well as those who may be interested in the Dual Language program in the future. For more information, contact Dr. Rocio Del Castillo via email or at (847) 659-6157.